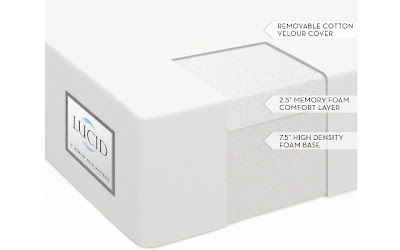 The Queen Size LUCID® by LinenSpa 10" Memory Foam Mattress, 25yr Warranty is currently selling for just $269.99 on Amazon.com! You will be saving 68% off the listed price of $849.99 with this home furnishings deal. 348 out of 558 customers gave this mattress a 5 star rating! Open cell technology allows air flow, keeping the mattress cool and comfortable. Anticmicrobial and resistant to allergens, mold, bacteria and dust mites. Soft, doughy consistency quickly conforms to weight and pressure. Zip-off antimicrobial and anti-dust mite soft velour washable cover.